How safe is your data … really? Just because you have a backup plan, it doesn’t mean your data is safe; let alone easily accessible in case of a technical or natural disaster. 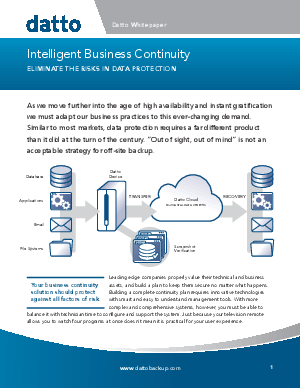 In this white paper Datto product manager Ian McChord explores the different types of risk in IT infrastructure and the ways intelligent business continuity can best mitigate that risk.